in fines and quit the psychiatric hospital business altogether. Investigators discovered fraud to be endemic within the psychiatric industry  so pervasive that today it constitutes a top law enforcement priority of the U.S. Department of Justice. There is even more to tell. Thats enough to hire 1.1 million new teachers, orbit 100 space shuttles, or fund all veterans benefits and services for a year. And thats a close estimate of the amount institutional psychiatry shamelessly rips off from the government or from insurance companies each year. Dollar for dollar, it is the most corrupt part of the health care system. Expect psychiatry to come under further scrutiny in April 1997, when the Illinois Public Mental Health System and state psychiatric institutions go to trial in a class-action suit filed four years ago. The 17-page complaint lodged by three former patients on behalf of all individuals admitted to Illinois state hospitals charged that each of the states psychiatric institutions houses patients in a dangerous, violent and filthy environment. It alleges chronic mismanagement, waste and inefficiency on the part of the state institutions. Industry sources expect the Illinois case to have as profound an impact on public mental health systems throughout the nation as did the revelations of fraud at National Medical Enterprises three years ago. Insiders say that Illinois will be on the defensive from the outset. A report by federal court-appointed experts has already substantiated the plaintiffs claims. Lawsuits such as the one in Illinois have been brought against the psychiatric industry and its institutions for decades. But psychiatry continues to sing the same old song. First, psychiatrists create barbaric conditions with funds they coax from the public coffers. Then, when their excesses and their abuses are exposed, they blame it on insufficient funds and demand more. Now, though, people know the tune, and its time the music stops. Just as fraud in the private psychiatric sector cost billions and taught a valuable lesson, so now the lesson is being extended to state psychiatric systems. The Illinois case may extend into a nationwide investigation surpassing the national probes earlier this decade. Ironically, National Medical Enterprises Psychiatric Hospitals Division was once referred to as the Mr. Clean of the psychiatric industry. Thus, it comes as no surprise that psychiatric institutions owned by Charter Medical Corporation, Community Psychiatric Centers and Hospital Corporation of America were also found guilty of fraud and patient abuse following the NME scandal. The proof of fraud and abuse lies in the actions of practitioners. As anyone who watches television and reads the papers is aware, psychiatric hospitals, psychiatric wings of general hospitals, and addiction treatment centers are still eagerly trolling for customers who have insurance. And the profession of psychiatry, which was allowed through the news media to shrug off the hospital scandal and blame it almost exclusively on hospital operators, continues making bold strides into the general medical field, with its plans to become a standard component of much hospital treatment. In September 1993, the U.S. General Accounting Office cautioned that because of increased scrutiny by insurance companies and other factors, Medicaid and other government funding sources would become the primary targets of psychiatric fraud. That warning came too late. Psychiatrists and psychiatric institutions had already bilked Medicaid by means of a new scheme. Their target: Medicaids Early and Periodic Screening, Diagnosis and Treatment Comprehensive Care Program. Designed to pay for early detection and treatment of medical and dental problems, Medicaid had expanded this program to provide mental health coverage in April 1992. Hundreds of children  including 205 boys and girls between the ages of one and five in Texas alone  suddenly became mentally ill and were placed in psychiatric institutions at a cost of $800 a day. 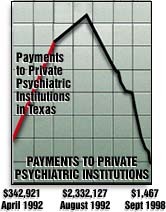 Payments to private psychiatric institutions in Texas soared from $342,291 in April 1992 to $2,332,127 in August 1992. After Medicaid clamped down on the bogus admissions and new state laws went into effect in September 1993, the amount dropped to a trickle: $1,467 per month. A number of the psychiatric hospitals involved recently paid settlements to Texas after defrauding the Crime Victims Compensation Fund  established to aid victims of crime. A similar situation was also reported in Oklahoma. Many new examples of psychiatric fraud have proven the statement to be only too true. One instance involved a psychiatrist who bilked another psychiatrists insurance company to treat the Post Traumatic Stress Disorder his colleague supposedly acquired after a minor fender-bender. In another case, a Georgia psychiatrist, James E. McClendon, reduced his Medicaid billings for treatment of children and adolescents from $6.6 million in 1994 to $6.1 million in 1995. Those billings caught the attention of the Georgia Department of Medical Assistance (DMA), which investigated and found he had billed out an average of 488 hours of therapy a week. of the $411 Million paid in Health-care related fines in 1994 $375 Million Were paid by psychiatric Hospitals. In one four-year period, the number of psychiatric institutions doubled. OUTBREAK OF MENTAL ILLNESS: After medical coverage expanded in April 1992, many children suddenly became mentally ill and wound up in psychiatric institutions. After measures went into effect in 1993 to clamp down on fraud, the mysterious outbreak disappeared. The DMA soon learned McClendon wasnt alone. Several other mental health practitioners billed Medicaid in the neighborhood of $1 million a year  likely the reason expenditures for one mental health program increased more than 11-fold in four years. Many Georgia children were actually recruited through door-to-door solicitation and flyers. That Fuller-Brush approach to psychiatric sales is not only atrocious. Its also illegal. Not only did this procedure subject children to dangerous psychiatric drugs and other treatments they did not need, it denied vital services to others. Medicaid funds were not available for such items as vision care and preventive dentistry. Meanwhile, Aetna Life Insurance Company learned it had been victimized by psychiatric fraud on the other coast. Near the end of 1995, Aetna filed a multimillion-dollar lawsuit against psychiatric institutions owned by Paracelsus Healthcare Corp.
After Charter Medical Corporation settled with the Texas Attorney Generals Office following the industry-wide fraud scandal in 1993, it said it would use the settlement as an opportunity to reassert our leadership in industry reform and our commitment to higher standards for patient care and treatment. But it led the industry in the wrong direction. In December 1995, Charter paid the Texas Attorney Generals Office another $1.5 million for violating the settlement agreement. Psychiatrists seem to go out of their way to prove Afield is right. On February 12, 1996, the Orlando Sentinel reported that unsuspecting overweight people were being lured by advertisements for luxurious fat farms into psychiatric hospitals which then billed Medicaid for insurance to treat their mental illness. Florida Medicare fraud complaints soared from 10,000 in 1992 to 25,000 in 1994. As this article goes to press, a new scandal is brewing in Colorado. While other health care providers were forced to endure Medicaid cuts, psychiatric facilities for youth were allowed to continue billing at higher rates. Seeing the availability of funds, greedy psychiatric centers signed up children and adolescents faster than the state could raise the money. The Denver Business Journal offered a clue as to why psychiatric centers  glutted with staff  claimed they could not endure the cuts imposed on the rest of the health care industry. The Journal reported that the state-run Colorado Mental Health Institute at Fort Logan had 15 psychiatrists and 15 psychologists on staff but only 24 beds. Charter Centennial Peaks Behavioral Health System maintained 97 psychologists and 22 psychiatrists to care for patients in 72 beds. One frugal hospital of 57 beds limits its psychiatric staff to 50.